I hope happiness will snow on you along with real snow if possible. Have a great one everyone! I made this for a Secret Santa I participated in, I don't watch Fairy Tail so please don't fight whether you like the couple or not, if they're in character or not, it was just the request to use these characters. This wall was complicated to put together, since there are no scans with Juvia and Gray properly together and almost all Fairy Tail scans have all the characters in them, crowded and impossible to wall. I had to crop scans and put them together, I think I went over the Fairy Tail scans gallery about 10 times. Before the couple looked like this I had 3 other arrangement ideas. I didn't like them much so I decided on this one. The story goes like this: Juvia was waiting for Gray and when he arrived he surprised her by leaning on her back. That's why she looks at him giggling and he has that "look who I bumped into" smile. 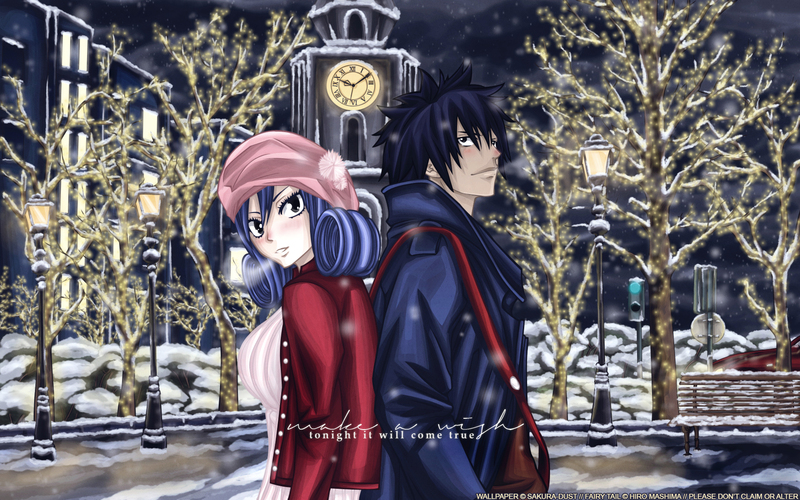 I used this picture as lights inspiration (they're also Fran approved) and I may have added a bit too much snow, but honestly, I'm annoyed because I won't have a white Christmas myself, far from it actually unless a miracle occurs, so at least I gave Juvia and Gray a date in snowy streets. I had about 50 images in this wall's folder, a dozen with Fairy Tail, the rest background elements, here are some of them: 1, 2, 3, 4, 5, 6, 7, 8. The other version has no text and you can find the render at EDD! A Fairy Tail wall! :D wow, nice way of putting those two scans of the characters together. This reminded me of Trofichi's VK wall coz the BG looked similar. You never cease to amaze me with multishading. (Or maybe I'm soo amazed at multishadings especially on the clothes because I rarely do that). I totally love the clothes *hands down*. As for the BG - like I said, it reminded me of trofichi's coz of the big clock, but yours is nice also since you manage to place different elements like the chair, car, stoplights which are kinda new. I just wished you'd blur the clock coz the numbers and the circle of it looked sharp compared to the tower itself. I dunno if it was intentional, coz I find the clocktower and the 2 characters not in the center? (Maybe that was intentional, coz you placed other elements on the right). I think I would prefer to see people in the streets? or maybe they'd look overcrowed already, but that's just me though. Definitely a plus fave for me! I love seeing these white christmas walls. Ive never experienced one as its currently summer down here. :D I LOVE THESE TWO TOGETHER! Thanks for the brilliant wallpaper! 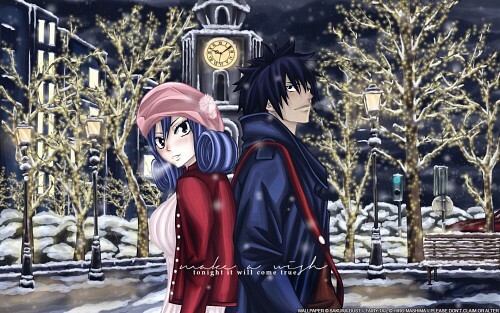 Nice to see Juvia comfortable around Gray for a change. Like how all the elements are put together to help bring out the mood. Can't wait to watch the next episode of Fairy Tail! how can I download this background?